World Series Champion, three-time All-Star and Chicago Cubs’ first baseman, Anthony Rizzo, is committed to giving back to his community. Driven by his own experience with cancer, Rizzo continues to find ways to make a difference for those who need it most. In 2017, Rizzo was awarded the Roberto Clemente Award. This award is given to a player who best represents the game through, “extraordinary character, community involvement, philanthropy and positive contributions” on and off the field. Family Reach has proudly partnered with The Anthony Rizzo Family Foundation since 2013. Together, our organizations have helped families battling a cancer diagnosis keep food on their tables, a roof over their head and maintain access to treatment. Rizzo’s connection to cancer goes far beyond his empathetic nature. In 2008, at the age of 18, he was diagnosed with Hodgkin’s lymphoma. After six months of treatment, Rizzo was deemed cancer-free. He returned to his normal life but was determined to do something for families battling a cancer diagnosis. 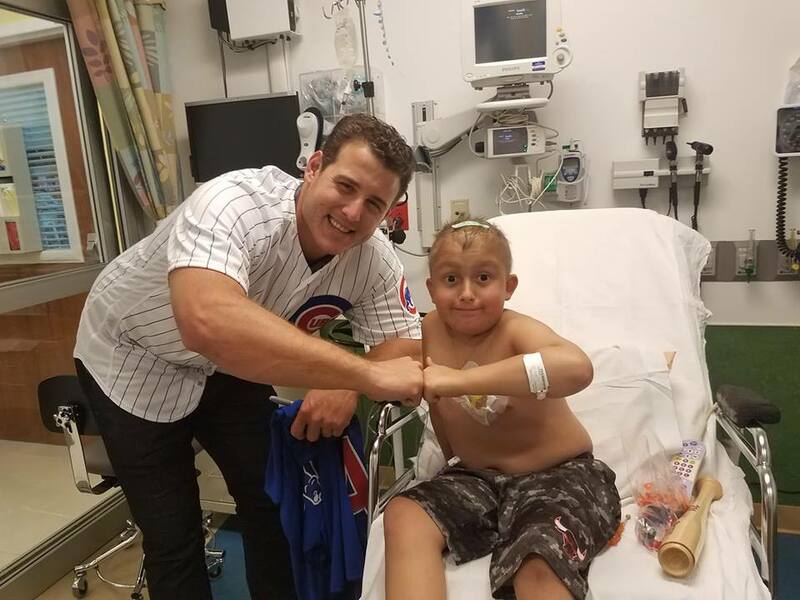 In 2012, Rizzo founded the Anthony Rizzo Family Foundation, which is committed not only to raising funds for cancer research but for providing financial support to children and their families throughout their cancer treatments. The shared mission of our two organizations has been the foundation for a strong partnership. To date, $675,000 in financial assistance has been given to 439 families, impacting over 1,900 people whose lives have been touched by cancer. The Anthony Rizzo Foundation is also committed to working with Family Reach to provide additional resources, like our Financial Handbook and our Financial Planning for Cancer program, to their families before they hit critical financial breaking points. “We love working with Family Reach. Our missions align perfectly, and to team up together to make an even bigger difference in the lives our families is so important,” says Rizzo. Our cancer-fighting families are the reason behind all that we do. This partnership helps to ensure that families no longer have to make difficult choices such as choosing between paying for parking at the hospital or putting food on the table at home. Thank you, Anthony Rizzo Family Foundation for helping us make a tangible difference year after year. We are grateful to continue this partnership and reach even more families across the nation. Want to make a donation today? Click here.